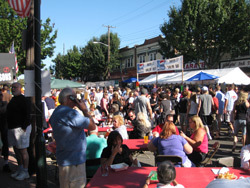 The 32nd annual Point Pleasant Seafood Festival took place on September 19. Arnold Ave was blocked off, west of route 35, as was a portion of River Avenue and Bay Avenue. The weather was absolutely great. It was about 70 degrees and sunny. Parking was tough during the time I was there, in mid afternoon, but it was something that just required a bit of walking. All around the train station and on the streets just east of the highway were packed with cars. We simply had to move further away from that area to find parking along the street. The food booths were all along the south side of the street and stretched up to Bay Avenue. The only break in food stands were the music stage, which was set up just opposite River Avenue. Further along Arnold Avenue and along Bay Avenue were arts and crafts booths and some things for the kids to do. You can find antiques, health information, pony rides and children’s games. We arrived at around 3:30 PM and the crowd was huge at that time. There were so many people that it was difficult to walk at times. If too many people stopped or there were too many people trying to buy something from any single booth it could cause a traffic jam of people. The food was great this year, at least at the booths that I sampled from. I had lobster, shrimp, scallops and some fresh lemonade. We had visited the Shrimp Box in Point Pleasant Beach the night before. They always have good seafood meals and we did enjoy our dinner. Yet the seafood festival food we had was much better. This was the first year I was able to attend the seafood festival and I hope I can attend again next year…and that the weather is as nice as it was today! Previous post: Governor’s Surf Fishing Tournament!